The seafront in Bray County Wicklow earlier this month. STORM GUSTS OF up to 130 km/h are expected from an Atlantic storm that is scheduled to hit Ireland tonight and the Road Safety Authority (RSA) is urging motorists be vigilant. The storm will be strongest in the Atlantic counties and is predicted to move northwest tonight and into tomorrow with southwest winds gusting 100 to 130 km/h. Frequent heavy showers are also expected with sleet and snow also possible on higher ground. With road conditions becoming potentially hazardous, the RSA is advising motorists about a number of extra precautions they should take while driving. A 23-year-old woman died last month when a tree fell on the car she was driving during severe weather and so far in total there have been 14 fatalities on the roads in 2014. A decrease on the 18 people who died in January 2013. In particular, drivers are being told to watch out for falling debris or objects being blown out onto the road as well as vehicles veering to the side. During heavy rainfall drivers should also ensure that they allow extra time to stop suddenly and make sure that they are at least four seconds behind the driver in front. While driving on roads where speed limits are above 100 km/h the risk of losing control due to aquaplaning is also increased. 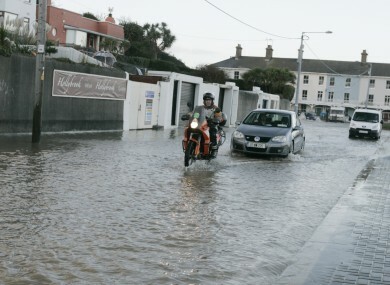 Very high tides have also been predicted this weekend and flood warnings have been issued in a number of counties. There is a serious risk countywide of both coastal and inland flooding and all areas which have flooded in the past could be seriously impacted. Conditions could be similar in nature and extent to the storm events of early January with the potential for structural damage. Tiernan added that river levels remain “very high” and arrangements have been put in place to continuously monitor the situation. Email “Falling debris, veering vehicles and aquaplaning all hazards as storm approaches”. Feedback on “Falling debris, veering vehicles and aquaplaning all hazards as storm approaches”.